I had this post all ready to go last week – I just had to finish off some photo editing. But then, I had a baby instead. After a crazy heatwave weekend that seeped into the bones, my waters broke with a midnight storm. T was born later that afternoon in the hallway of our home, the sun and breeze streaming in through the front door. We lay in bed that night exhausted and elated. And then… there were four. T is small and lovely, spends his days and nights eating and sleeping and occasionally opening his eyes to stare about. He gets a lot of kisses from his sister (and a few inadvertent pokes in the eye), and has made our lives both busier and more wonderful. Now it’s ten days on. We’re settling in, as is the heat. For now though, let’s talk about salad. I made this particular gem quite by accident a few weeks ago. It was the end of the week and the fridge was looking sparse, so I threw together everything we had left in the hope that it would work. 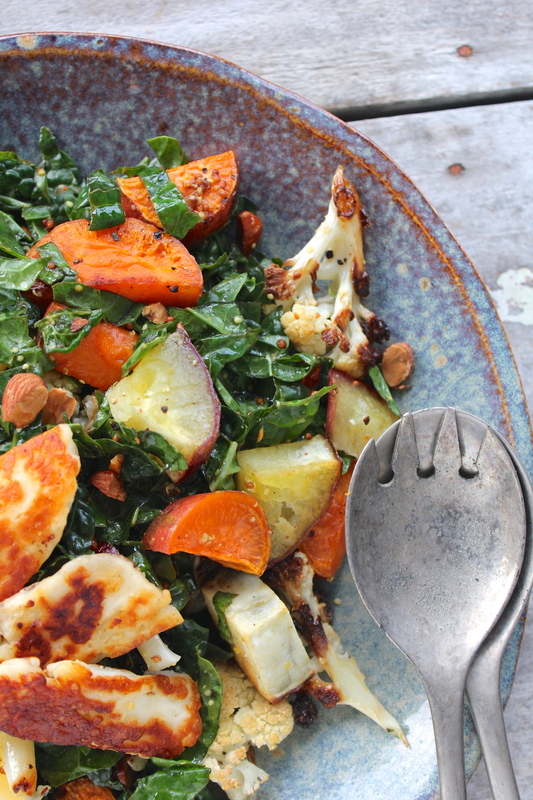 And this Kale & Sweet Potato Salad was born. S suggested it would be even better with some haloumi so a few nights ago I made it again, this time topped with fried haloumi, and let me tell you, S was right. Delicious. S had his alongside a steak, but I had mine as a meal in-and-of-itself, and was perfectly satisfied. 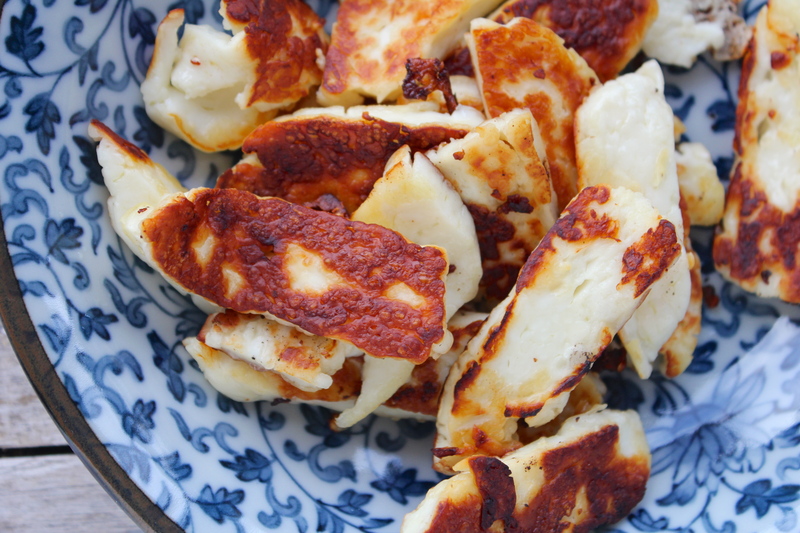 If you’ve not had much of it, haloumi is a Greek cheese traditionally made from a mixture of goat’s and sheep’s milk. It has a high melting point, which is why it is usually served fried or grilled. It comes in brine so is rather salty, but some freshly cooked halmoui with a squeeze of lemon juice is one of the great culinary pleasures. 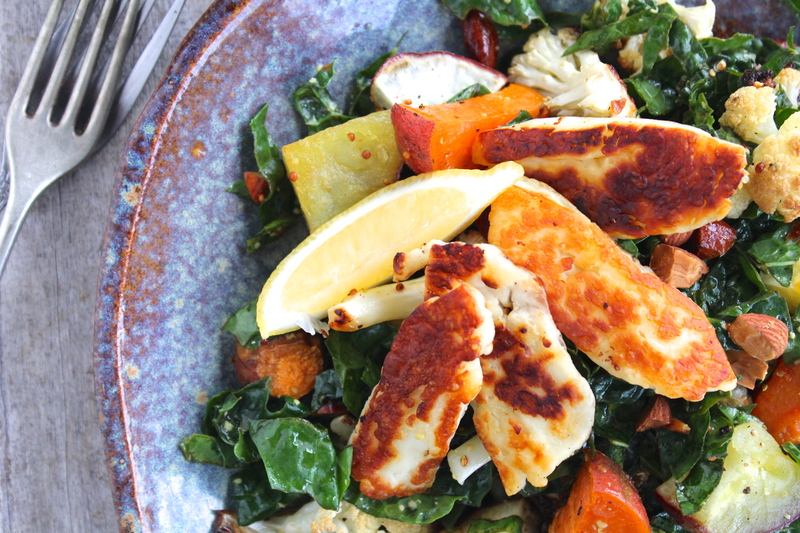 You can easily make this salad without the haloumi, but if you can get your hands on some it is well worth it. De-stem and finely shred the kale leaves, and put them into a large bowl. Juice one of the lemons and pour the juice, along with the olive oil, over the kale. 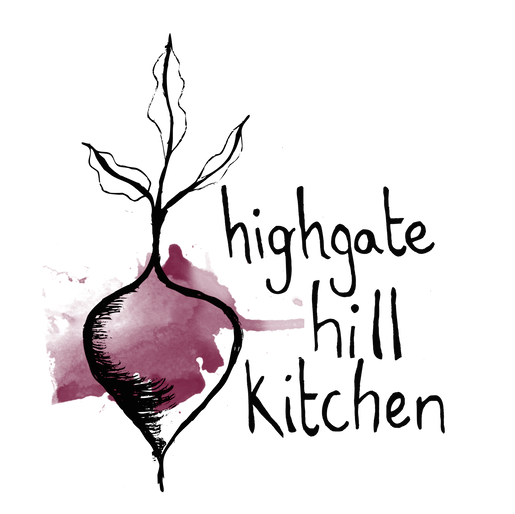 Using your fingertips gently massage the juice/oil mixture into the leaves until they are well-coated. Add the wholegrain mustard, mix through, then cover and leave for at least an hour. Pre-heat the oven to 200°c/400°f. 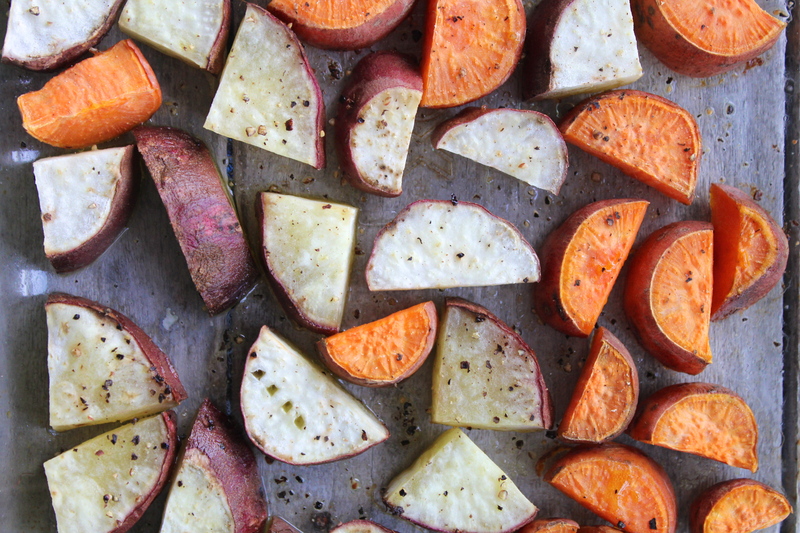 Cut the sweet potato into small-ish chunks and the cauliflower into medium-sized florets, place in a single layer on an oiled baking tray, season with a pinch of salt & pepper, and bake for 35 – 40 minutes, or until the cauliflower is browned at the edges and the sweet potato is soft. Remove and leave to cool for 10 minutes. 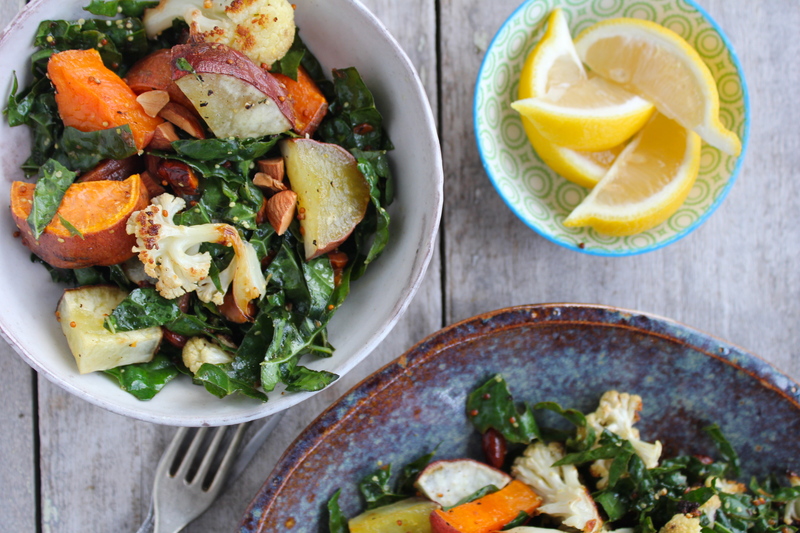 Stir the cooled sweet potato and cauliflower, along with the almonds, through the kale salad until everything is well combined. Have a taste, and season with a little salt & pepper to taste. Slice the haloumi into small slice, approx. 1 – 2 cm thick each. 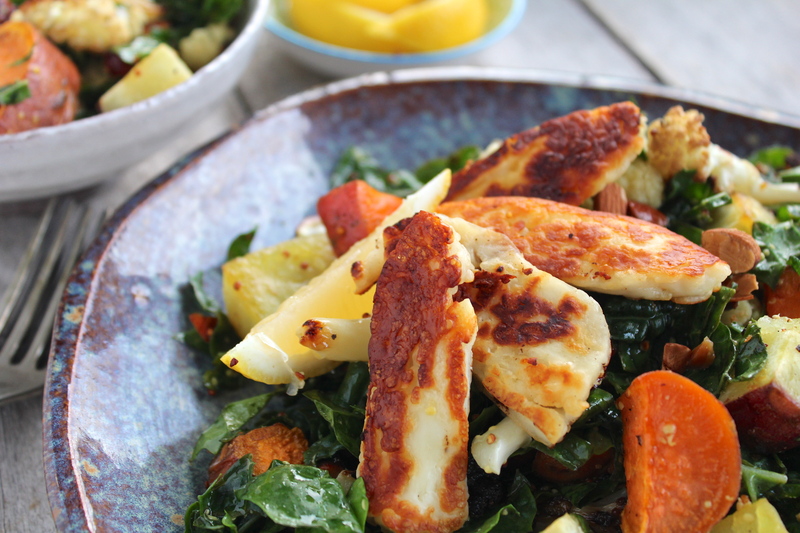 Heat a splash of olive oil in a pan over a medium-high heat then layer the haloumi into the pan in a single layer. Leave to cook until starting to brown (3 – 4 minutes), then flip and cook for the same amount of time on the other side. 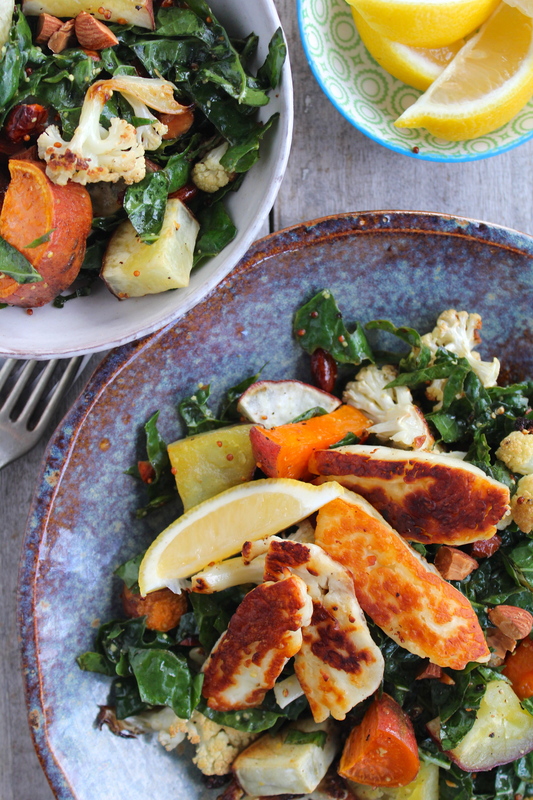 Serve the haloumi either alongside or piled on top of the salad, with the remaining lemon cut into wedges on the side. Wow, first of all congratulations on the baby! Second of all, I’m impressed you’ve got this post out all of 10 days after having the baby (though you did say you had it prepared already). And third of all the salad looks nothing short of amazing. Just the sort of quick but satisfying salad you need right about now and it has many of my favorite flavors.